BUKIT LANJAN: Action speaks louder than words … whatever, it’s 1Singapore! Period. Halimah Yacob, a former speaker of parliament from the Malay Muslim minority, won the presidency in a walkover after authorities decided her rivals did not meet strict eligibility criteria. While the role is largely ceremonial, the president has veto powers on key government appointments and safeguards the country’s substantial financial reserves. 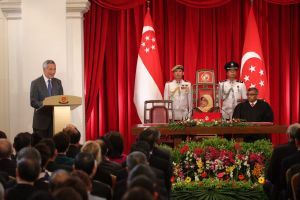 In her first speech as president, Halimah, 63, addressed the racial tensions that have sprang up as a result of the process and vowed to be president of all Singaporeans “regardless of race, language or religion”. "… Your swearing in today is therefore a significant moment in our history. Today we reaffirm the pledge that Mr Lee Kuan Yew made on the 9th of August 1965 in the first hours of our Independence. That this will not be a Malay nation, Chinese nation nor an Indian nation. Everybody would have his place, equal regardless of language, culture, religion …” – Lee Hsien Loong, Prime Minister, Singapore"
In 1965, Singapore was “forced out of Malaysia” (in Lee’s words). The tiny island republic had zero natural resources. Many predicted that Singapore couldn’t possibly last or survive as an independent sovereign nation. “Today, 52 years after, Singapore is ahead of Malaysia by leaps and bounds in education and economics. 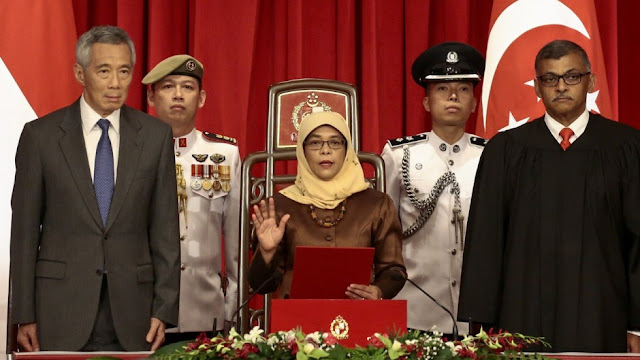 Perhaps the swearing in of its first female president and, also a Malay, is testimony of its successful government,” Gerakan Deputy Speaker Syed Abdul Razak Alsagoff said. “That a Malay can be elected in a Chinese-dominated state speaks wonders of societal tolerance and maturity. Can this or when can/will this happen in Malaysia?” he asked. Syed Razak said there would be certain quarters who will brush off the seat of the elected president of Singapore as merely symbolic or ceremonial. “To all such critics who continue to live in denial of reality, even if the election is symbolic or ceremonial, the same still cannot happen in Malaysia. “All we hear today from certain quarters of society are racial and religious slurs. Everyone telling and quarrelling over how one should eat and drink, sleep and pray. “In short, it is political toxicity to mix politics with race and religion because it threatens to destroy national harmony and unity,” he added. 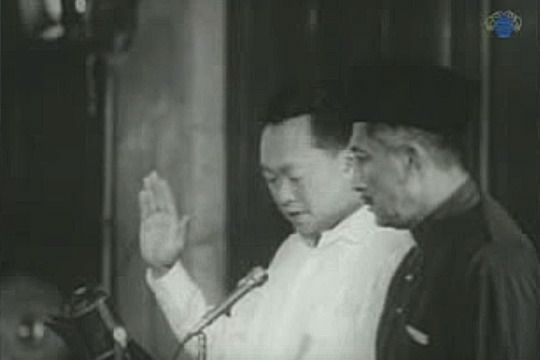 The swearing-in of Singapore’s State Government in 1963: Lee Kuan Yew taking the oath of office next to first president of Singapore Yusof Ishak after the 1963 elections. Syed Razak, who is Gerakan’s nominee to contest N.37 Bukit Lanjan in the coming 14th General Election (GE14), said Singapore “is a role model of racial and religious tolerance by administration”. “If only 1Malaysia can reflect a semblance of 1Singapore, we will forge ahead together socially and economically that much more faster,” he added. View the above video clip for what’s it’s worth to you or Malaysian society in general.